That is the conversation that Latinos Progresando plan to start in the windy city through their second annual MEX Talks event. Inspired by the popular TED Talks series, the event celebrates the contributions of Chicago’s Mexican and Mexican-American individuals to then foster a dialogue around harnessing their political potential in the city and in the United States. “[Mex Talks] will highlight folks that people know, but also those who are not well known but that have faced challenges and successes,” said Luis Gutierrez, executive director of Latinos Progresando. The one-day speaker series features prominent Mexican and Mexican-Americans, from the city of Chicago, to speak about their experience about a variety of topics through a uniquely Mexican lens. This year the name of the series is “What If Every Mexican-American Voted?” which will focused on highlighting the importance of the civic engagement of the Mexican-American community in Chicago and nationwide. Jorge Valdivia, an LGBT activist, will be one of the speakers at the event. He is recognized for his work and passion for the Mexican and LGBTQ movement in Chicago. We want people at the event to start a discussion, to ask questions and that those questions start a conversation,” said Gutierrez. Gutierrez hopes that the talks at the event raise awareness about the different issues, both good and bad, that affect the Mexican-American community in Chicago. 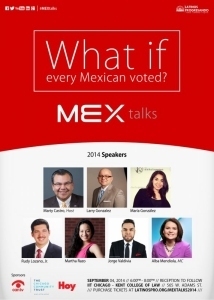 MEX Talks will take place Thursday, September 4th at 6pm at IIT Chicago Kent College of Law. Tickets are $20 and all proceeds will support Latinos Progesando’s mission. For more information, visit www.latinospro.org/mextalks2014.